Immensity + Intimacy: Brooklyn Bridge Park explores the reborn landscape on New York City’s East River as a prototype for reimagining the urban waterfront. Through an inventive series of strategies, including sculpting the site’s complex maritime edge, reusing salvaged materials, and embedding ecology and experience, the park, designed by Michael Van Valkenburgh Associates, redefines the Brooklyn waterfront as a central place in the civic imagination. 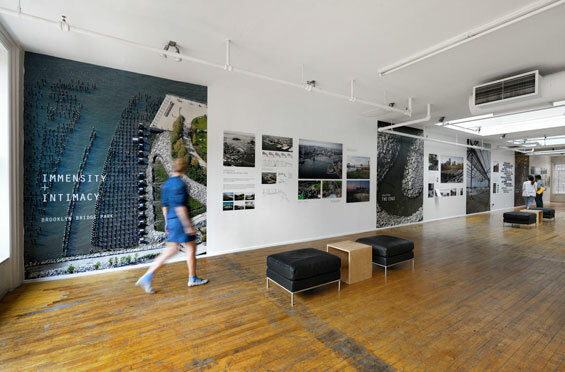 The Immensity + Intimacy: Brooklyn Bridge Park exhibition is part of the Van Alen Institute’s 2012-2013 exhibition series, River City: Waterfront Design for Civic Life, an investigation of how innovative riverfront design can act as a powerful tool for urban reinvention. Through its exhibitions and a series of related public programs, Van Alen will engage landscape architects, architects, planners, policymakers, urban advocates, and the riverfront’s broad public constituencies for dialogue and debate about the future of the urban shore. 4 October – Waterfront Design Debate – Michael Van Valkenburgh of Michael Van Valkenburgh Associates will be joined by Fred Kent, founder and president of Project for Public Spaces in a debate moderated by NYC Parks Commissioner Adrian Benepe. 10 October – Join journalist and author Tracy Metz (Sweet & Salt: Water and the Dutch), Susannah Drake (dlandstudio), Michael Marrella (NYC Dept. of City Planning), and other special guests for a panel discussion on strategies for living in harmony with water, and what New York City could learn from Dutch techniques.